The Colonel’s secret recipe includes hostages and robot hands. There have been a plethora of strange VR games over the years, but none quite as strange as the one KFC is using to train its employees. Created by W+K Lodge, "The Hard Way: A KFC Virtual Training Escape Room” is a bit like a skit in the Saw film franchise. Basically, Colonel Sanders wants to play a game. To escape the room you’re trapped in, you’ll need to adequately prepare a serving of his famous chicken. You may be thinking, that doesn’t sound too bad, and true enough, the first few sections of the VR “game” are pretty standard. Sure, a bag of chicken magically descends from the ceiling, but it’s all in good fun. It’s only after you hit the halfway mark that you realize things are getting progressively weirder. 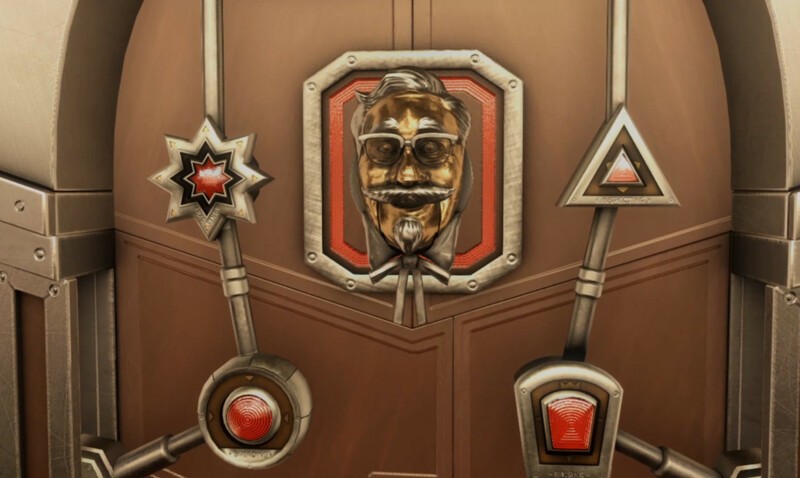 For example, a robot version of Colonel Sanders eventually spawns out of his picture frame on the ceiling, gets behind you like the pottery scene in Ghost, and helps you prep the chicken. Um, thanks? They certainly succeeded there, as the colonel's obsession continues all the way to the end of the game. Once your chicken is fully cooked and the game comes to a close, you’re expected to take a drumstick from the fryer and put it in the Colonel’s mouth (his head is acting as a doorknob apparently) in order to escape to freedom. That scene, in and of itself, gives us a serious case of the creeps. I come in peace bearing drumsticks, please let me out. Overall, we can't help but hand it to KFC and W+K Lodge for their creativity. The Hard Way is a humorous VR game that trainees will certainly remember. If not for the weirdness of it, than certainly for the horrific undertones of being locked in a building and forced to make chicken (basically your average day on the job at KFC). Additionally, the VR training program isn’t meant to replace on-the-job training which employees receive. Although, there’s a possibility it could augment training in the future according to a statement given to Engaget by KFC Head Chef Bob Das. Will VR training programs become more commonplace in the future? Let us know your thoughts in the comments below!